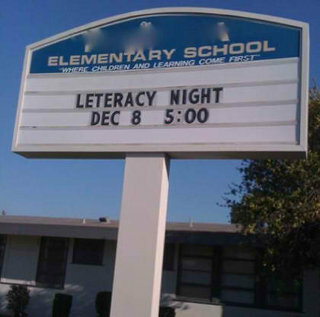 Everyone has an eye-rolling story about a teacher who misspelled words on the chalkboard or on printed assignment sheets, but a school’s marquee is too often is the scene of the crime when it comes to high-profile errors, too. The following photos document such transgressions. Too bad the person responsible for posting this sign didn’t take a “seconnd” look at the negating note. And using hyphens as a decorative motif was ill advised. What HDJ has a “nacke” for is not paying attention to the little things — like how to spell knack. I’d like to give HDJ the benefit of the doubt and assume that this photo was taken immediately after the sign was posted, and that it was immediately corrected. But how many of you have seen errors like this go uncorrected day after day? Imagine the blushes ’n’ chuckles at this event. The people responsible for posting these signs are administrative staff — or, in the case of a sign like this, which requires a ladder for access, likely a custodian — who are often less well educated than principals and teachers, but aren’t they provided with a memo or at least a handwritten note showing the exact wording (and lettering)? Guess not. 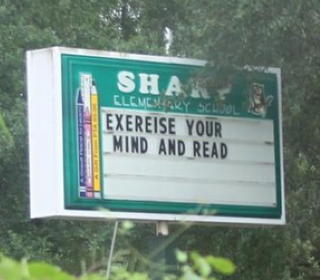 Question: What’s worse than misspelling a word on a school sign? 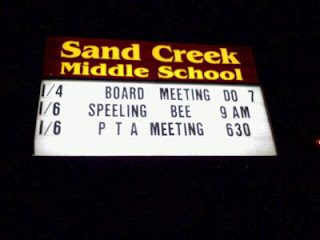 Answer: Misspelling the word spelling on a school sign. Done. The images above are coming from the Writer’s Keep and English Fail Blog. Oh my! I found this site while double checking my formatting for a business letter and I think my inner grammar/spelling-nazi had a geek-gasm! I love it here! 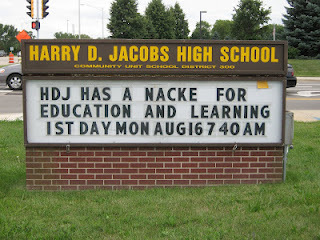 I’d like to give HDJ the benefit of the doubt and assume that Nacke was the surname of the person giving the opening address, and that the sign was a play on words that is lost out of context. I don’t think I’m inventive enough to excuse the others. This are egregious errors, however, your using the term “less well educated,” is not much better. I believe “less educated” would have been a better choice. The dumbest sign I’ve seen near schools are the ones that declare them “drug free” zones. Those signs imply that you are free to sell drugs to minors and that they are welcome to take them outside that zone. Saying certain people may br less educated is not polite. Show the faux pas signs with less opinions, please. Stephen, what a great response and yes, I also lack the imagination to think of an excuse for the others. “Slow children ahead.” Amazing how many neighborhoods are populated by the developmentally disabled. The poor children. Polite? Are you kidding me? What does that have to do with right and wrong? These are the cornerstones of education we are talking about here, they have a responsibility; I say show these mistakes (agree with Hacke faux pas…possible option) on billboards, open some eyes, this is real!!!! I’m of the opinion that this attitude about being poilte, tolerating a lacking educational system, might be a contributing factor to the state of our present, poorly performing, educational system and the product that it is putting on the streets. By the way, Happy Independence Day! Proof positive that proofing is a necessity. Too bad the very first sentence in this post contains an error. The word “is” following the word “often” should be deleted. I think the “too” preceding the word “often” should be deleted. Slightly tangential to the spelling issue is the wording of signs. For a long time here the buzzword (particularly in bureaucratic circles) has been ‘signage,’ as in “Proper signage will be erected” instead of “We will put up proper signs” (a friend once remarked that ‘signage’ sounds like ‘sewage’!). Another is “Disabled Parking Space(s)/Toilet(s)” instead of “Parking Space(s)/Toilet(s) for Disabled People.” If the parking spaces/toilets really were ‘disabled,’ those people, like me, who needed them, would find that fact incredibly frustrating. *When we were all supposed to be on the lookout for ‘terrorists,’ governments revived an old sign (dating back at least to WWI, I think) – “Be Alert, Not Alarmed.” As their forebears had in earlier days, present-day graffitists would alter this to “Don’t Be A Lert – We Have Enough Lerts Already,” and, continuing the joke, “No, Assert Your Individuality – Be A Larmed!” Finally the sign would be withdrawn with no offence to any but the pompous asses who had originated it. @Robin: IMHO, just as you are free to disagree with the poster’s opinions, he is free to express them. This isn’t Miss Manners’ website and politeness is not the point here. I personally am relieved that this website isn’t strangled by being PC. If you don’t like something, you can express that, but please don’t ask for others to conform to your idea of politeness. There might be people who think this whole post is “mean.” I, for one, think it’s a keeper! Patrick, take heart. Those slow children have a productive future. I saw a sign just this morning that said, “Slow men working.” Those slow children will grow up to get jobs. I can understand how these mistakes happen. Most of the signs are put up by the custodian/maintenance person. What I don’t understand is why they are not told to correct them the next day. @Ed Buckner: I notice that there are no “Slow women working”…what will the slow GIRLS do when they grow up?! @Lew: I certainly am with you on this!